Regardless of what type of roof you have on your home or business, it can start to show signs of wear and tear over the years as dirt and other debris build up on it and harmful sun rays take their toll. When this occurs, Custom Coating Restoration can send Yorba Linda, CA cleaning and coating experts to your property to turn back the clock. As an experienced and trusted color sealing company in the area, we provide residents with a wide variety of roof cleaning, coating, and color restoration services they can rely on. Regardless of whether you call on us for assistance with your residential or commercial roof, we utilize our effective roof cleaning techniques and power washing services to bring your roof back to life quickly and affordably. Through roof power washing, we are able to eliminate the noticeable presence of dirt, mold, algae and mildew from your roof’s surface to reveal a clean, better appearance in just a couple hours. In addition to cleaning, Custom Coating Restoration can also offer you different roof coatings and sealing options to protect your roof over time. Specifically, we can apply Cool Roof Coatings that will reflect the sun and keep your home or business cooler inside. We can also apply a commercial flat heat reflecting roof sealer in Yorba Linda, CA that will keep the temperatures in your business cooler by blocking the sun. While tile, metal, and composite roofs will all last for a very long time, they can start to show their age when the sun causes them to fade. Custom Coating Restoration can apply tile, metal, and composite roof coatings and complete sealing jobs to transform the look and longevity of these types of roofing materials. Is it costing you an obscene amount of money to cool your commercial business in Yorba Linda, CA? It could be because your roof is absorbing too much heat from the sun. Fortunately, you can avoid this issue with a commercial flat heat reflecting roof sealer from Custom Coating Restoration. It will stop that powerful heat from penetrating through your roof and prevent infrared light from doing irreparable damage. Although tile roofs can be tougher than most other roofing materials, even they can’t avoid the damage that the sun can cause. There beautiful coloring can fade over time and become discolored if you don’t care for them properly. 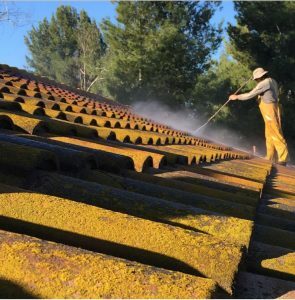 Custom Coating Restoration has Yorba Linda, CA roof cleaning and coating pros who can help you protect your tile roof with proven roofing color restoration services and can even color-match to ensure all tiles are the same color. Custom Coating Restoration can help you with a variety of Yorba Linda, CA roof cleaning and coating services to improve the appearance of your existing roof rather than paying for a replacement. Give us a call at 800-621-6722 today to learn more about these services.